With what started out as a blueberry kind of day, freezing and packaging fresh local berries for the year ended up with a surprise bag of blackberries and perfect for a last-minute sauce for seasoned and roasted chicken breasts. The chicken breasts were seasoned with a homemade concoction adapted from Michael Chiarello, containing fennel seed, coriander seeds, toasted and ground in a coffee grinder turned spice grinder. To this blend, I added kosher salt and ground white pepper. I make about a cup’s worth of this fennel seasoning and keep it stored in a container to use it to for seasoning all kinds of meat and poultry products…a little goes a long way. 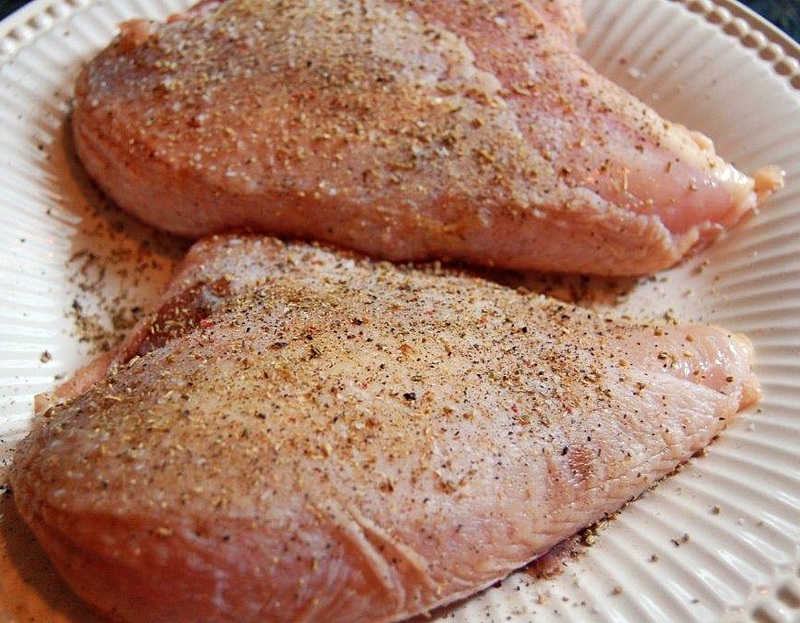 Season chicken pieces with a little of the spice, salt and pepper and a sprinkle of paprika. Heat a large ovenproof sauté pan or cast iron skillet over medium high heat. When the pan is hot, add the 2 teaspoons olive oil (this was for two large chicken breasts. Sauté the seasoned chicken breasts, skin side down until golden/lightly browned, turn and sauté for another two or so minutes. Add about ½ cup of chicken broth, sprinkle chicken with fresh thyme leaves, place the pan in the oven, and roast chicken until almost cooked throughout. My chicken roasted for about 15 minutes, basting with pan juices now and then. My chicken roasted for about 15 minutes, basting with pan juices now and then. Have sauce ready to spoon over the chicken for the additional last 5-7 minutes of roasting. Dissolve about a teaspoon and a half in ¼ cup of chicken broth. Finally remove chicken to a warm platter and place pan over med low heat, add splashes of white wine, and stir broth with cornstarch. The sauce should thicken slightly (easily thinned with additional broth or wine). Toss in several more berries just to warm through serve over chicken breasts. 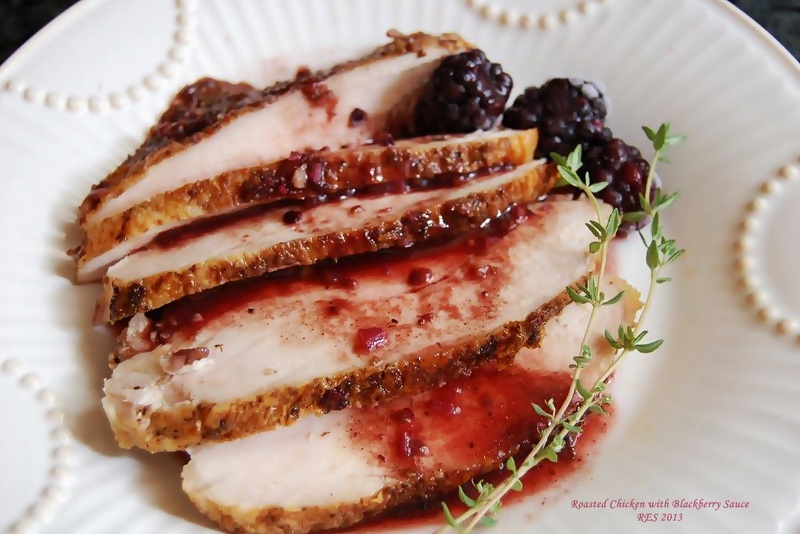 Mash 16-18 large blackberries, add 1/4 cup chicken broth, 1-1/2 tablespoons brown sugar, 2 tablespoons white balsamic vinegar, 1-1/2 teaspoon EVOO, 2 minced cloves of garlic, 1/4 teaspoon paprika, and cumin. Thoroughly blend. 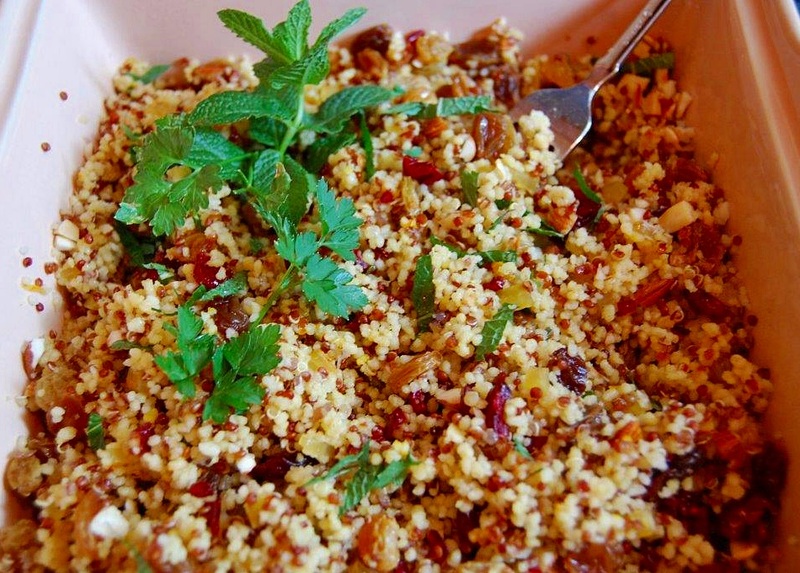 I served a red quinoa and couscous citrus seasoned salad adapted from a recipe in Mediterranean Fresh.